READY to get noticed? Then you need one of these. 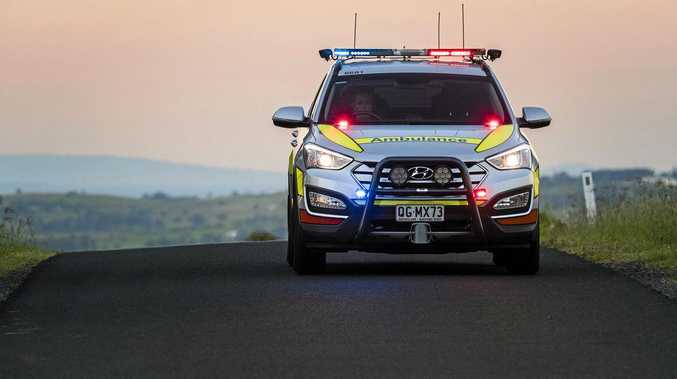 After a week piloting Australia's tiniest SUV - the Suzuki Ignis - I swear I got more attention than I've had driving Porsches, Maseratis or Ferraris. Okay, maybe not Ferraris. Pleasingly, the bulk of the attention was positive. This Ignis is in top spec GLX trim and has been wonderfully personalised. 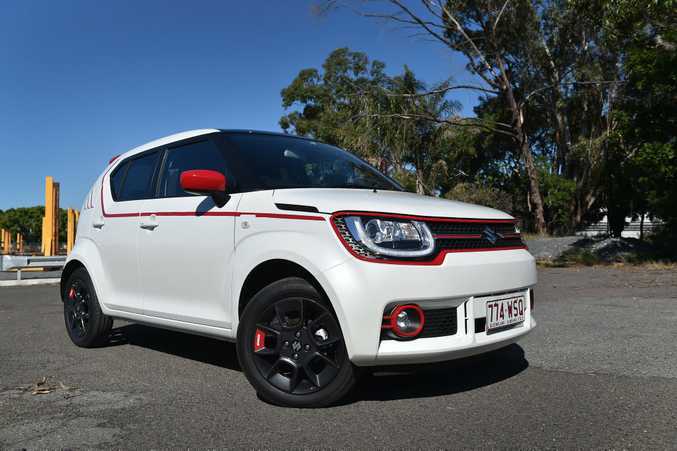 Black rims under its white body, red "go faster" stripe down its flanks, red side mirror covers and red surrounds for the cheeky face's headlights, grille and fog lights. It's the way car companies used to funk up their sportier models back when car building and driving were less serious. The Ignis is a much needed shot in the arm for the city car class, and new cars in general. It embodies the fun and youthful spirit that should come with owning your first car, while also being perfect for the young-at-heart urbanite keen on cheap yet cool transport. You can hop in an Ignis for $16,990 drive-away, but most will prefer to drop a few extra grand on this GLX model I tested thanks to a pretty impressive standard inclusions list. 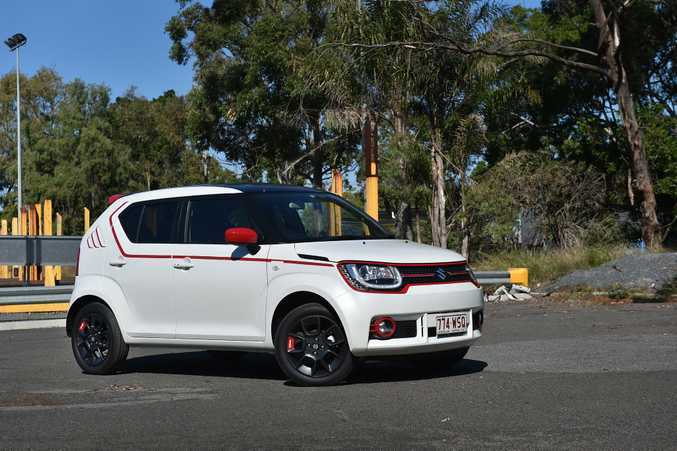 For $19,990 drive away you get the seven-inch touchscreen, sat nav, cruise control, rear camera and Apple CarPlay/Android Auto also found in the entry-level Ignis GL, but also score a CVT auto gearbox, 16-inch alloy wheels, auto LED headlamps, keyless push button start, auto air conditioner and a sliding two-seater rear bench which moves on runners to give either more boot space or leg space. Other manufacturers should take note of some of the Ignis's inclusions at this price most aren't this generous. That said, the Ignis misses out on active safety systems prevalent in many rivals -such as auto emergency braking and blind spot monitor. You can't fit them as options either. Your powerplant is a 1.2-litre four-cylinder without a turbocharger. That means just 66kW and 120Nm on offer, but as it's asked to shift along just 895kg it proved to have ample punch for zipping through town. 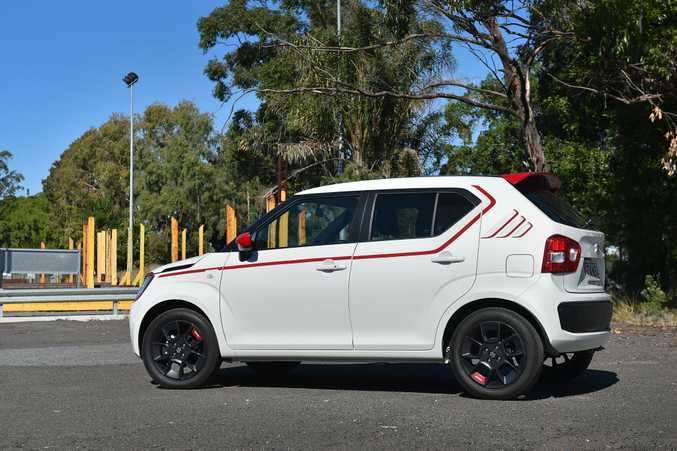 It may be classified as a small SUV, but neither Suzuki or we consumers are under any illusions that the Ignis is strictly a sealed road offering. Being classified an SUV simply because it has a high-ish ground clearance (180mm), flared wheel arches and taller body design shows how out-dated our SUV/passenger car criteria are. It's a very small looking car in the metal, has an ickle 264-litre boot and no all-wheel-drive option is available. True SUVs, really, need to be a bit more all-round capable than this. But let's take it for what it really is: an enjoyable little city car with look-at-me individuality. It is a joy to live with in urban areas. Zippy enough to cut through traffic and manoeuvre into gaps, while parking is all-too easy thanks to its diminutive size and rear view camera. The CVT automatic - a single speed transmission there for weight saving, economy and smoothness - is a bit unsatisfying when compared to the Ignis GL's five-speed manual, but serves fine around town. On the open road, as with most CVT gearboxes, it is whiny when you floor the throttle and can feel slightly jerky. Most buyers will barely notice it or will get used to it very quickly though. The engine is also in the tame category, but gutsy enough for daily duties and certainly brilliantly economical. 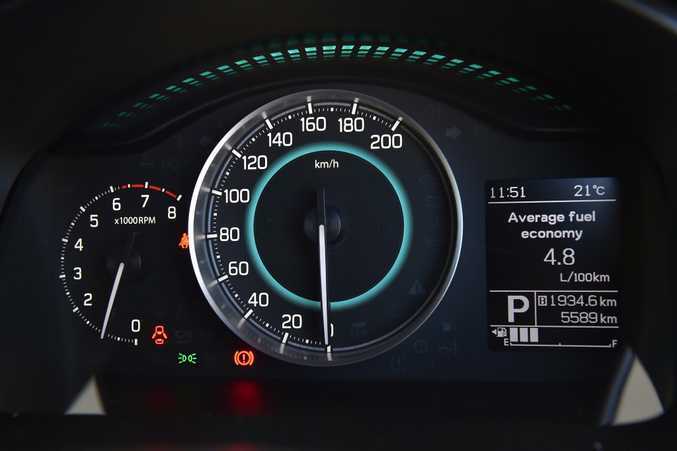 I returned a 4.9l/100km average fuel use on my test. 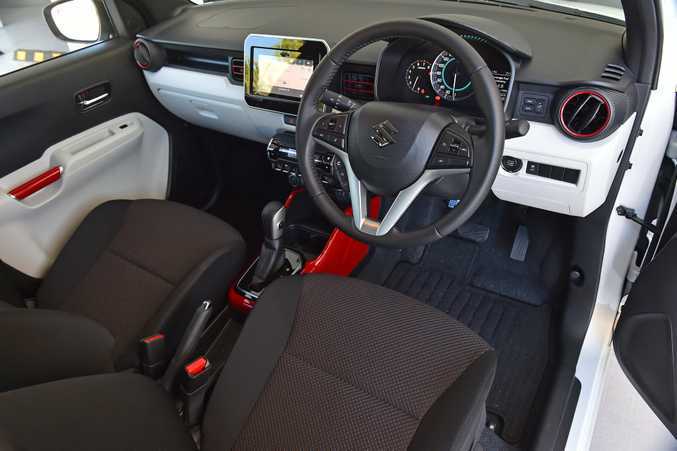 Suzuki does have a hot little three-cylinder turbo engine (as seen in the new Swift hatchback), and this mated to a manual gearbox in the Ignis would make for a real gem of a thing. Add all-wheel drive too and that would give a real point of difference, and some cheap off-road thrills. Throw the Ignis at some turns and there is a bit of body lean on account of its ride height, and at 110kmh on the highway the wind noise does encroach somewhat. But around town is where it shines. Keep the Ignis in its natural environment and it's a cracking little drive. Such are the titchy dimensions of the Ignis it's by no means vast inside, but perhaps not as small as you'd first think. Due to its high roof (the Ignis is taller than small SUV rivals such as the Mazda CX-3 or Toyota C-HR) all four occupants get excellent headroom. 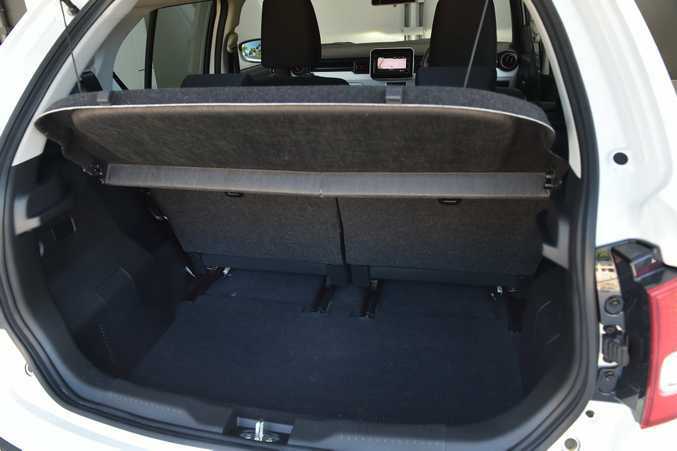 Rear passengers get decent legroom too, meaning first car buyers could hit the hippest shopping strips with three mates comfortably accommodated. It's a simple dashboard layout but loaded with personality. Matching the doors, the dash plastics are a mix of white and black colours, with red flashes jazzing things up on the vents, centre console and door grab handles. Seats are sink-in comfy, but don't expect any soft-touch plastics in this cabin. Strictly the hard stuff in here to keep costs down. 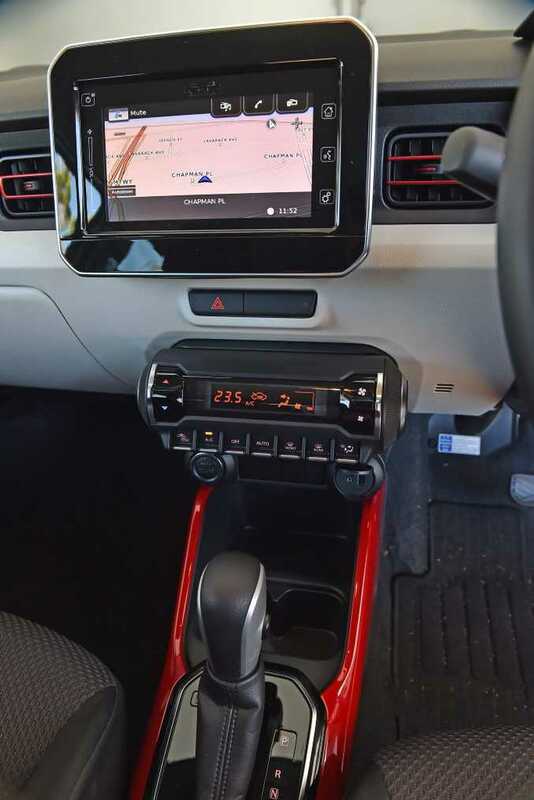 The money saved goes on goodies like the easy-to-use 7-inch monitor and its on-trend infotainment. Is there really anything to touch the Ignis for funkiness? Certainly not at this price. There's always the unfairly unloved cube-like Kia Soul ($24,990 drive away), or the less practical but hugely stylish Fiat 500 ($17,990). 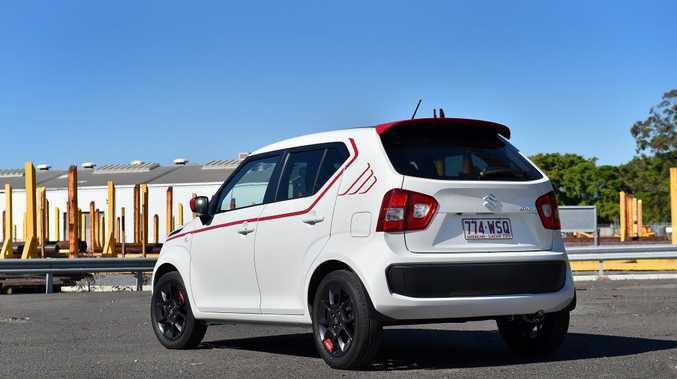 More conventional are Suzuki's own Swift ($16,990 drive away) or maybe Skoda's roomy Fabia Wagon ($17,640). Lots of love for the little "Iggy Pop" during our week-long affair. It has the personality so lacking in the city car segment, generous inclusions and offers great fun around town. It's cheap too - reflected in the cabin plastics and lack of active safety systems - but it remains a compelling, fun and value-packed plaything. CAPPED SERVICING $199 per service. SERVICE INTERVAL Every six months or 10,000km. SAFETY Not crash tested, 6 airbags. ENGINE 1.2-litre four-cylinder petrol, 66kW/120Nm. DIMENSIONS 3700mm(L), 1660mm(W), 1595mm(H), 2435mm(WB). What we liked: Quirkiness, great fun looks, included equipment especially Apple CarPlay and navigation, cheap drive away price, decent interior space for its size, ability to customise. What we'd like to see: Less plasticky cabin, a digital speedo, a turbo engine perhaps with three-cylinders, more active safety gear at least optional, more time between service intervals.